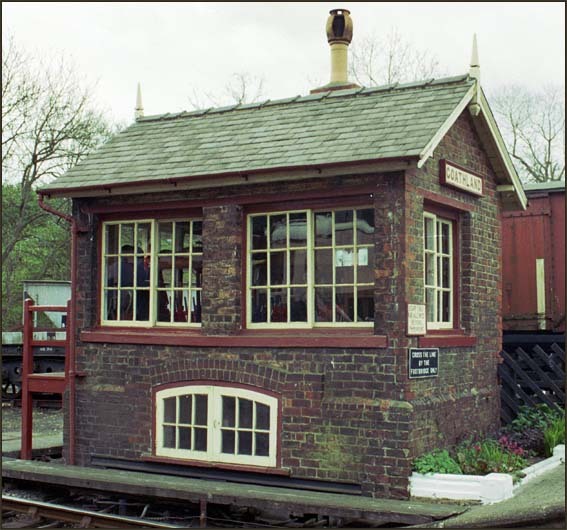 This small stone NER signal box has been saved by the North Yorkshire Moors Railway it was reopened by them in 1972. One of the Goathland fine signals. This photo taken from a train from Pickering. The North Yorkshire Moors Railway (NYMR) is one of the top Heritage Railwaysin the UK. The railway runs though some of Yorkshire's finest moor land. The North Yorkshire Moors Railway runs from Grosmont to Pickering. There are stations at Goathland and Levisham. There is also a halt at Newton Dale. This website is Ukrailways1970tilltoday.me.uk it is a web site on railways, but it is not just on the trains, but all things railways, with photos, which I have taken from the 1970s till now. I take photos of all things railways, steam diesel and electric trains, signal boxes, any thing that is on the National Rail network, which was BR when I started taken photos or heritage railways like the North Yorkshire Moors Railway on this page. Today Northern Rail EWS, East Coast, and EWS are just some of the names you can see on the trains. These names keep changing, but that means I have to keep taking photos. I also take photos of preserved railways like the North Yorkshire Moors Railway with steam diesel and electric trains.There is still lots more to add and I keep taking more photos.